She really does have a beautiful array of hats. Not even just hats. Her whole wardrobe must be overflowing with sophisticated and elegant attire. Everything from hats, to coats, scarves and shoes! She has the perfect outfit for EVERY occasion. In fact, I recently discovered this interactive map of her travels, and not only does it designate a whole section to her fashion sense, but it also has an array of images in the actual map which showcase how truly amazing her dress sense is! I especially love the coat she wore in Ireland, it's stunning! This photo is gorgeous and funny. 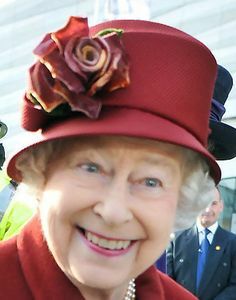 I would never wear many of her hats, but they look Elisabeth II style from far, we are used to see them on her royal head.